"I’m really excited to be working with jump 4 Joy. I have admired the products for a long time and would say they are the highest quality and have widest range to offer on the market. The light weight wings and weighted poles make them very easy to move around, and change courses easily, as well as all the different designs being great for schooling spooky horses over!" Born in 1987, Paul Gaff started riding in his local Pony Club around the age of 5. From a non horsey back ground he went on to represent his club in all three disciplines. 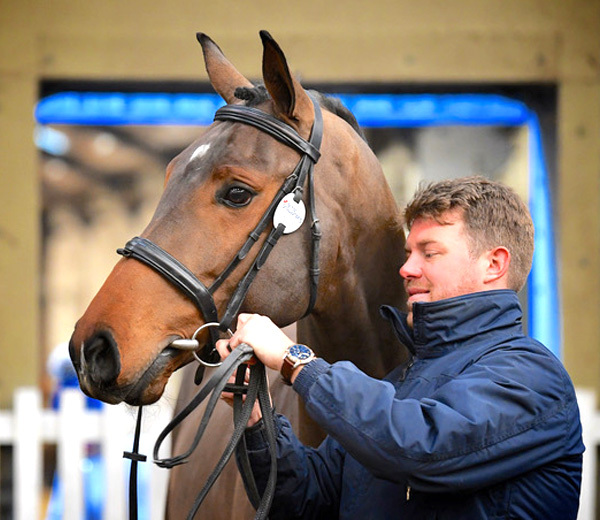 Eventing is where he found his passion for horses took him and at 18, he left home to go and work with Nick Gauntlett. Here he progressed to FEI 2* and gained valuable experience to go on to be based out of the internationally renowned Talland School of Equitation. Here he continued to event his string of horses while training to Grand Prix in pure dressage with Pammy and Charlie Hutton. Setting up on his own yard at 23, he was based in the south Oxfordshire area for 8 years where he successfully produced many horses from breakers to international level and developed his skills as a coach. Now a BHS accredited professional and UKCC level 3 coach, Paul has coached all over the UK and United States. Focusing on pure show jumping, Paul has already jumped his first Grand Prix and had much success from national 4yo classes to 1.40M level as well as winning big classes at Hickstead Derby meeting and the All England jumping championships. Based at the beautiful Lillingstone Lovell Manor, Manor House Equestrian boasts facilities second to none, where Paul continues to produce and compete a string of exciting show jumpers! Successes since going into pure show jumping include wins at Bicton young horse champs, Western Lawns Young Horse Championship and jumping in the final at the 4yo Championship at Hickstead All England jumping champs. And having set his sights on jumping his first Grand Prix in 2018, he accomplished this in just 4 months. Paul now focuses his time on producing a top string of horses and riders from grassroots level - international. He runs an annual sponsorship program for up and coming riders as well as many clinics with both himself and some the worlds best coaches from his base in Buckinghamshire.